WASHINGTON, D.C. (NBC) – President Trump has made another gesture drawing applause in Israel. 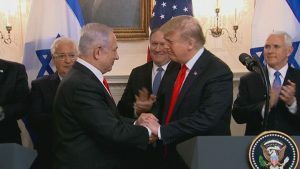 With Prime Minister Benjamin Netanyahu on-hand, Trump signed a proclamation of US’s recognition of Israeli sovereignty over the Golan Heights. That’s the strategic territory Israel seized from Syria during the Six-Day War in 1967. Syria and other Middle East nations angrily denounced President Trump’s move, which ended decades of US neutrality on the issue. But the president said he’s fully committed to Israel’s security. The move comes after President Trump drew plaudits in Israel for moving the US embassy to Jerusalem. The event could be seen as a boost to Netanyahu ahead of Israeli elections next month.